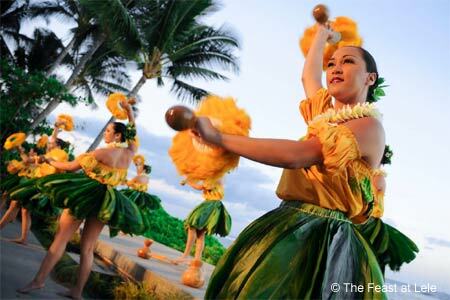 A creative, gourmet luau that takes you on a Polynesian journey through dance, song and food, in an intimate, beachfront setting. : Most luaus are fairly standard buffets --- and include such ersatz Hawaiian fare as fried chicken. The Feast at Lele in Lahaina puts a gourmet spin on things with a sit-down dinner at individual tables. The food is a multi-course culinary tour of Polynesia, including dishes like slow-roasted kalu'a pork and pohole fern shoots from Hawai'i or grilled mango ginger chicken with Tahitian vanilla aïoli and mango relish representing Tahiti. The open bar serves up all the expected tropical cocktails: Mai Tai, Lava Flow, Blue Hawaii, etc. And, of course, there's a show, which also cruises the islands, climaxing with a vivid Samoan fire knife dance. It comes at a price, but what a creative leap from the usual Waikiki whirl.